My tomatoes have normally grown to 7′. 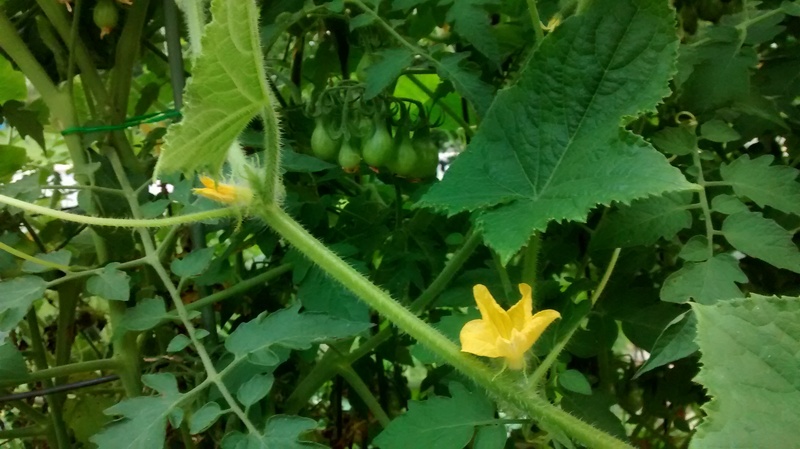 This year we’re successfully growing cucumbers: so successfully that they have also reached 7′. And some have come around the corner of their trellis/structure to meet their neighbors and friends the plum tomatoes. Since the 6 tomato plants are all supported by a strong structure of metal trellises with bamboo in between and it’s all quite stable, they have no problem with their friends the cucumbers coming around to visit and sharing the stability. At the other end of the tomato structure, orange Hopi Lima beans are starting to wind their way among the tomatoes too. In the winter I designed that structure in my head, knowing we were going to plant more tomatoes this year. Little did I know how really useful it would become. Soon we’ll be able to pick all the food for a meal from the tomato structure! I always plant things close together, and since things do so well here, some parts of the garden are starting to look a little like a jungle. We do all get by with a little help from our friends. It’s been the best ever so far Jackie!